A few years ago, at a TED conference, I watched Bill Gates give a speech about improving education. Gates stated that of all the variables he had examined, he believed the most effective way to improve education was simply to have good teachers. Various studies have confirmed that teachers are one of the greatest and most important factors in the quality of education that students receive. In the 1988 movie Stand and Deliver, Edward James Olmos plays Jamie Escalante, a math teacher in a poor Hispanic neighborhood. He is convinced that his students have a lot of potential and ends up turning gang members and others whom people do not believe in into great students. In the movie (based on a real-life story), Olmos is able to turn the lives of the students around, based on his expectations of them. Because he expects people who normally would be rejected by society to succeed, they do. When you look at your life, your role models, and the people around you, ask yourself what their expectations of you are. Do the people around you expect you to do great things, or do they expect you to fail or not succeed? Whether you like it or not, you will be profoundly influenced by the expectations of people around you. When people are aware of others’ expectations about them, they usually perform in accordance with those expectations. The best quality for teachers to have is their belief in their students and ability to set high expectations for them. The best quality you can seek in your friends and the people close to you is that they have high expectations for you. The best addition you can have to the quality of the lives of your friends, children, and significant others is to have high expectations for them. The quality of your life and the lives of the people around you will be determined by expectations. The expectations of others around you can lead either to your improvement or to your destruction. Expectations that lead to destruction are some of the more dangerous things you need to avoid in your life and career. If you are fired from a job for doing something wrong and you go to a new job, you should make sure your new employer does not know about your past negative behavior. Why? Because if a new employer knows why you lost your job, he or she is going to view you as someone who might make the same mistake twice. I am not telling you to lie. What I am telling you is that you need to limit the amount of negative information out there about you and the number of people who have this negative information. People’s views of you will color their expectations of you, and if this view is negative the results you get in your career and life may also be negative. Expectations are communicated in a variety of ways. They are communicated by a person’s tone of voice, the language used, and many more subtle factors. These expectations influence us and our performance in ways that are both conscious and subconscious. Throughout my entire business career, I have maintained multiple offices throughout the United States. One of my businesses is legal recruiting. Here, I have had as many as ten offices throughout the United States at many times. Formerly, I had a student loan business and had three offices for this. In the job site business I am in, I have typically had at least three offices working on this. In reality, all of these businesses could be operated from a single location. There is no need for multiple offices. There is some tactical advantage to having all of these offices; however, in reality the businesses could operate with just one office doing all of the work. Why all the offices, then? The reason for so many offices has to do with market factors that can create horrible and devastating momentum and expectations for groups of employees when things in one business go bad. By having multiple offices, the business and its people are diversified and so are their opinions and expectations of one another. In the legal recruiting realm, for example, some markets are good and others are bad at various points in time. If the market is really bad in New York and good in Los Angeles, the people in New York may become bitter or angry, stop trying as hard, lose confidence, and share their lack of enthusiasm with others. They may say it is hopeless and there is no use trying. They will look at their peers and subtly (and not so subtly sometimes) believe that others will soon be experiencing the same negative results. In contrast, if the market is really good in Los Angeles the people in this office will be very excited. They will all be doing well, and with a group of people together all doing well, each of them will raise the others up. The enthusiasm will raise the spirits of everyone, and the group as a whole will do very well. Even average performers may be raised up to very good performers because group psychology is such that everyone will expect everyone else to be doing well. Since I run several businesses, I cannot be confident that any one of them at a given point in time will not suddenly experience a reversal led by market forces. All businesses experience reversals at some point. Groups of people that are in an environment that is not doing well do not experience a lot of happiness and enthusiasm. Have you ever seen people who think they may lose their job? They experience a drop in the output of their work, and their enthusiasm for their job is also likely to decline. Their fear and belief changes the way they act, and they ultimately do find themselves fired. Their belief in others’ expectations and opinion of them becomes a self-fulfilling prophecy. Your success or failure is a product of the expectations of those who are around you. For hundreds of years, people have escaped negative impressions and expectations of them in one area by moving somewhere else. To escape rigid class systems and other prejudicial views of them, people have continually moved to the United States from all over the world. In a similar vein, to escape the negative views of them in small towns and other areas, people have moved to large cities that are more anonymous. For many people, the large city is a refuge from others’ opinions of them in smaller and more provincial areas. If you lose a job in a small area of the country, or are marred by some sort of scandal, often the best medicine is to simply move somewhere else. You do not want a life governed by negative impressions of you. Similarly, if you experience great success in a given area, you should do your best to stay there. Others’ positive impressions of you will help carry you forward and buoy you up. When I was in college I met all sorts of interesting people who had been real successes growing up. One had been the president of his high school class, first in his class, captain of the football team, and more. The only problem was that he was from a small town in a remote state. When he got to college he got horrible grades because he was simply not prepared for the rigors of study at our school. Everyone around him started acting like he was not smart enough and was unworthy of being a student at the school. Within a few months, everyone thought he was a loser. He was locked up for hitting his girlfriend, began abusing alcohol, and was expelled from the school in less than two years. If this guy had stayed in the small town he was from or had gone to a local school, his life would have been different. People around him would have expected great things. He would not have gotten bad grades. He probably would have continued his pattern of leadership and achievement. The problem was that he put himself in an environment where he was over his head and others came to have very poor expectations from him. There is nothing unusual about the example above. I have always been really bad at chemistry, for example. I hate the subject and was lucky to make it out of high school after taking the class. If I put myself in an environment where all I had to do was study chemistry beside a bunch of chemistry geniuses, I would be in serious trouble. I would have low self-esteem, my classmates studying chemistry would not think too highly of me, and the odds are pretty good I would be depressed a lot of the time. In contrast, I have always been really good at other courses. In one discipline I was so good, I was offered a scholarship to go to graduate school for a PhD during my junior year of college. I never would have had that self-esteem unless I was studying that particular discipline. It is important to continually surround yourself with people who have high expectations of you. It is important to do things that you are good at so that you reinforce others’ positive opinions of you. Many people surround themselves with people who have low expectations of them and this ends up doing them a great deal of harm. You also often find yourself around others with low expectations of you because you are doing something you should not be doing or are associating with those you should not be. When you are around those who have low expectations of your abilities, then you tend to perform in the manner they expect of you. When you are around those who have high expectations, you tend to rise to this level as well. Nothing is more important than finding a place where you are around those who appreciate your abilities and have high expectations of you. When people are aware of others’ expectations, they usually perform in accordance with them. Outside expectations can lead to either your success or your destruction; surrounding yourself with low expectations can, in turn, lead you to under-perform and further distance you from your career goals. When you surround yourself with people with high expectations, however, you will rise to levels you may not have thought previously possible. 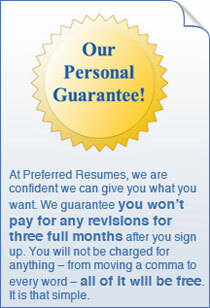 "Thank you for helping me with my resume and cover letter. Over the past few weeks, I have submitted my documents to online databases and received quite a few responses to them. I am even going in for two interviews next week. I am so pleased. I hope I get an offer!" "Working as a paralegal for the past ten years while taking care of my kids, I have found it hard to get my foot in the door for more serious positions. I thought I might have been presenting myself poorly, so I paid for a resume edit. The new version was so different and more detailed than my original. If only I had thought of this stuff ten years ago! Thanks for helping me with this. After completing coursework for my degree this term, I think I may finally be able to land a new position."